Stephanie Rozene is a ceramic artist who is dedicated to the advancement and development of the field of Craft History and Theory and in particular the use of historical ornament as a visual language. Rozene’s research and art making focuses on the exploration of personal relationships through use and the role that pottery form plays in communicating meaning. She makes work in the form of the utilitarian pot but is inspired by and grounded in conceptual, historical and theoretical approaches to ornament, form, use and making. 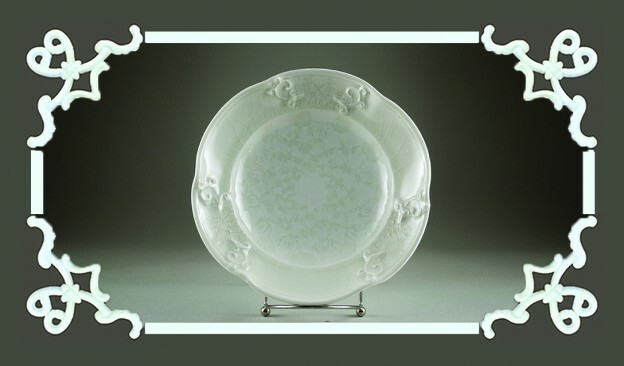 Through the medium of ceramics (and with special attention to specific pattern, ornament, and form) I am currently exploring the politics of European and American dinnerware and tracing international developments in this medium from Presidential china back to the reigns of French kings Louis XV and Louis XVI. By extrapolating patterns off of china patterns Rozene creates a new visual language that speaks to not only national/international identities but also to the extravagances to which government goes to in order to maintain its identity. Through collaboration with other artists in various media she creates dialogues between culture, use, spending, consumerism, conflict, and excess through pattern. Rozene holds an M.F.A in ceramics and craft history from NSCAD University in Halifax, Nova Scotia, Canada and a B.F.A from the New York State College of Ceramics at Alfred University in Alfred, New York. She is currently an Associate Professor of Art and the Ceramics Studio Head at Hartwick College in Oneonta, NY and serves on the board of trustees at Watershed Center for Ceramic Arts in Newcastle, ME.